"Fastening deck boards with the FUSIONLoc Hand Driven Tool gives you a durable, secure deck with a nice, clean finish." Using a hidden fastener system to fasten deck boards is a growing trend in decks and outdoor living areas. Hidden fastener systems anchor deck boards without face screws, so there aren’t screw heads visible on the top of the boards. 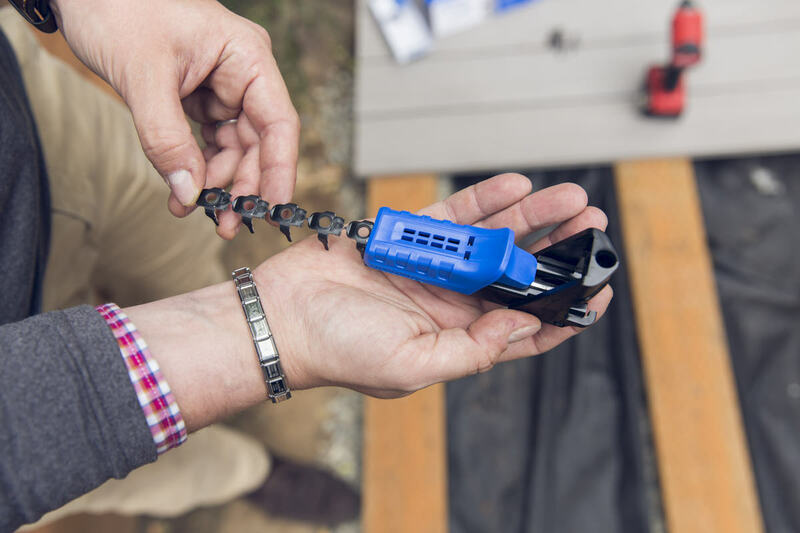 The FastenMaster FUSIONLoc collated hidden fastener system is a quick, secure way to fasten grooved deck boards to joists without fasteners showing—it also speeds installation time immensely. FUSIONLoc is a stainless steel clip-and-screw, which anchors edge-grooved deck boards to joists. The clips provide three points of contact, securely anchoring boards while reducing chances for squeaking or board movement. The clips virtually disappear once installed because of their matte black color. Unlike some clip systems that tie all boards together, FUSIONLoc allows you to remove one or more individual boards if you ever need to replace one. FUSIONLoc is a collated system and can be applied in two ways: using the FastenMaster FiveSHOT Tool (pneumatic nailer) or using the FUSIONLoc Hand Driven Tool. Either method will speed up the installation time, but today we’re focusing on the FUSIONLoc Hand Driven Tool, which is simple enough for anyone to use. 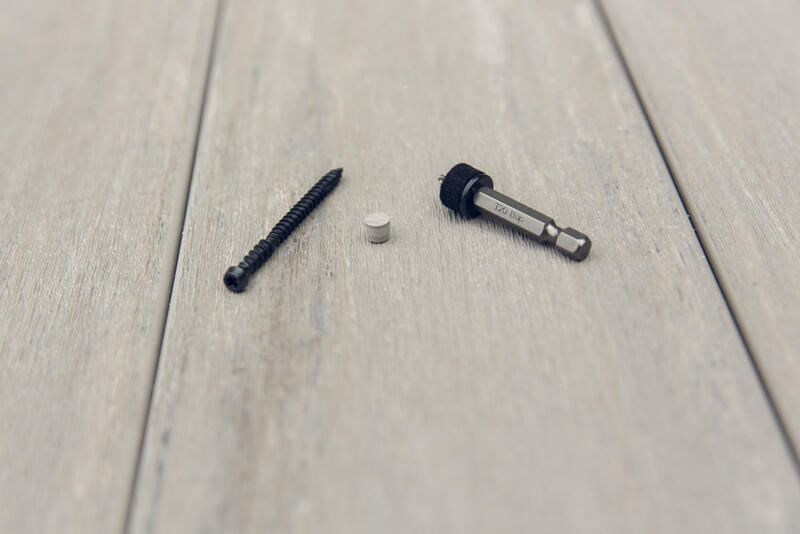 And don’t worry—despite the name, you won’t be using a screwdriver to anchor these fasteners. The Hand Driven Tool is simply a jig that feeds and aligns FUSIONLoc clips into the grooves of edge-grooved deck boards, and readies them for driving into the joists below. The jig is spring-loaded to advance the next clip after driving the prior one home. To drive the stainless steel screws into place, you’ll need a drill/driver or impact driver. 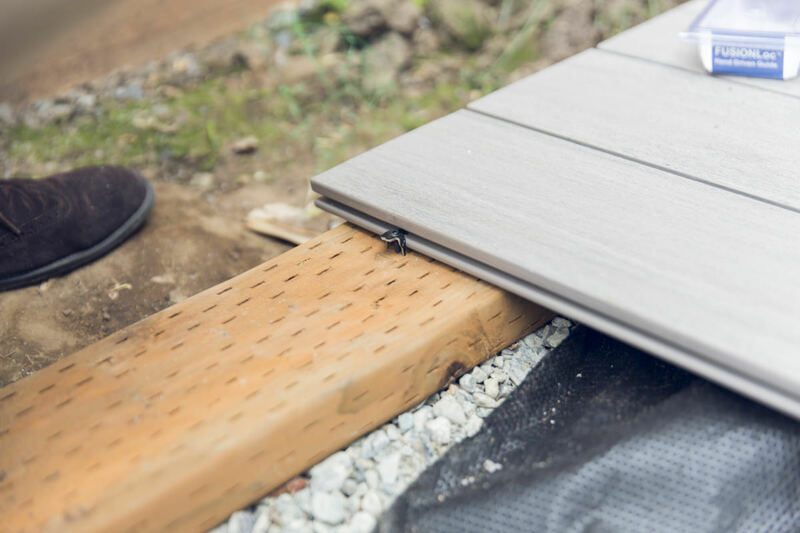 Something to keep in mind: Many hidden fastener systems use clips that fit the edge groove of a deck board—oftentimes, homeowners don’t want to view that edge groove. That’s where FastenMaster’s Cortex hidden fastening solution comes in—it’s a great companion to FUSIONLoc that uses a special bit, screw, and plug to anchor a deck board without screw heads showing. 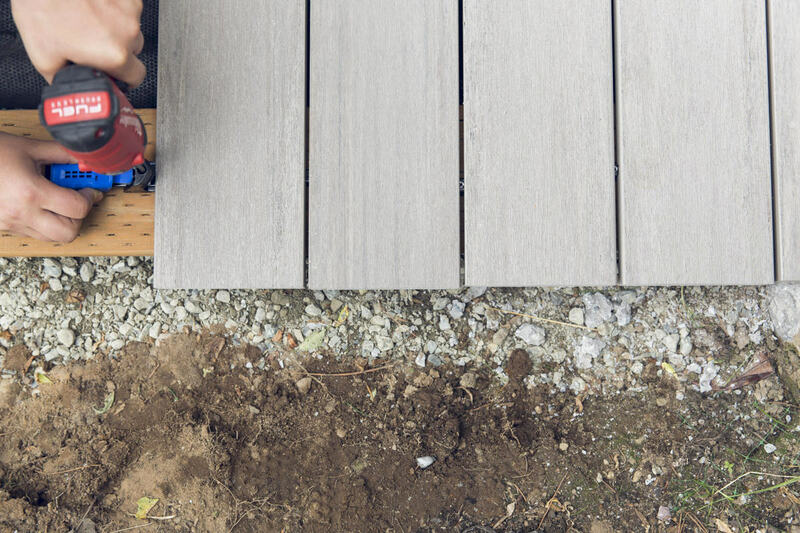 That means the boards on the perimeter of your deck (including first and last boards, stair boards, and breaker boards) can also be fastened without visible screws, just like in the middle of your deck. FUSIONLoc is particularly suited to work with grooved PVC deck boards from AZEK, and works with some types of TimberTech decking, too. As always, check for compatibility before purchasing your decking and fasteners. For this project, we're using Coastline from the AZEK Vintage Collection. Coastline looks like weathered wood at the seashore while offering all the durability of PVC decking. Gray remains a popular color for alternative and composite decking, and the subtlety of the finish gives it a realistic look. Plus, AZEK offers a 30-year fade-and-stain warranty and a limited lifetime warranty. It's one of the best guarantees out there. Secure the front edge of your first deck board using an L-bracket, Cortex, or another method. Place the jig firmly against the back edge of your first board. Now grab a screw, drop it into the jig, and drive it home with the provided bit inserted into your driver. The clip will break away from the other clips in the jig, and the next clip will advance automatically. When you’re ready for your next board, simply feed the deck board into the FUSIONLoc clips at the previous board, tap it firmly into place, and drive in more FUSIONLoc clips at each joist. When you reach the last board in the run, fasten the back edge in the same manner as when you started the run, using an L-bracket, Cortex, or the like. Easy, right? 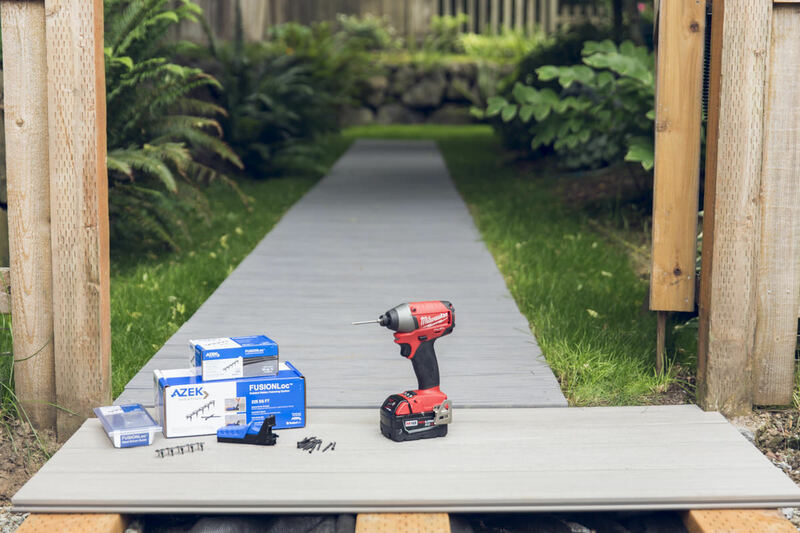 The process of fastening the deck boards with the FUSIONLoc Hand Driven Tool is fairly simple, and once you’re finished, you’ll have a durable, secure deck with a nice, clean finish. 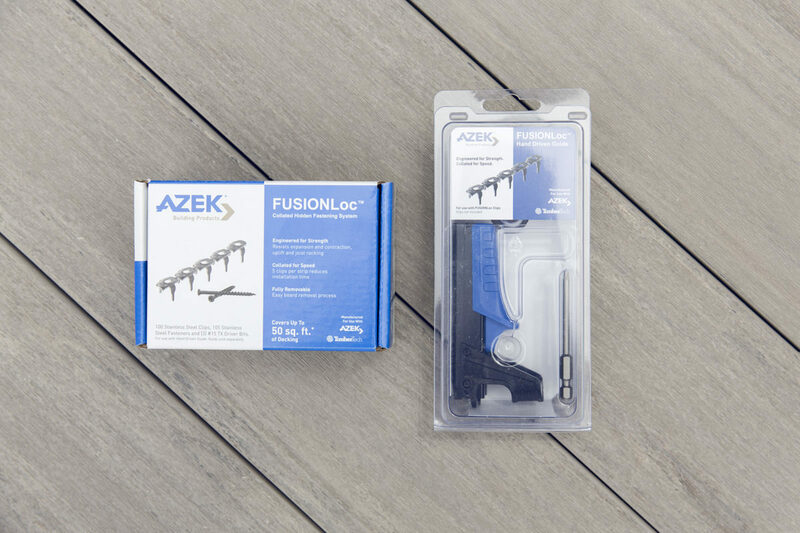 Learn more about the FUSIONLoc hidden fastener system from AZEK, including their FastenMaster FiveSHOT Tool pneumatic nailer, and Cortex hidden fasteners for end boards including first and last boards, stair boards, and breaker boards. We’ve had over 100 days of rain in Seattle this winter. It’s been grey and dark. And it’s time to lighten up! Let’s talk about how to choose the right color to lift the mood of your next painting project.